Ariel Gel – A tale of bank holiday boredom. So, it’s a Bank Holiday. I’m bored and a bit of a geek. I see the Ariel gel ad on TV talking about how good it is at low temperatures and I want to try it for myself. 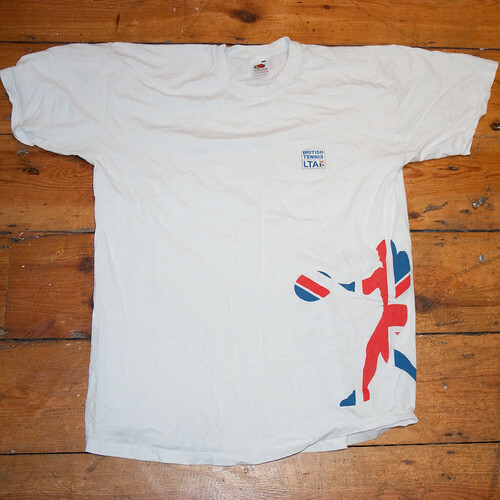 So I take an ordinary white t-shirt (A freebie I won at a Davis Cup match at Wimbledon). 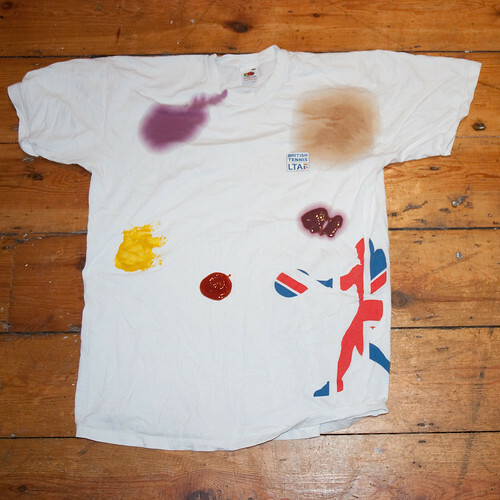 I add to this the traditional laundry detergent ad stains: Red Wine, Tea, Mustard, Ketchup and Blackberry Smoothie. I leave to stain for a couple of hours. 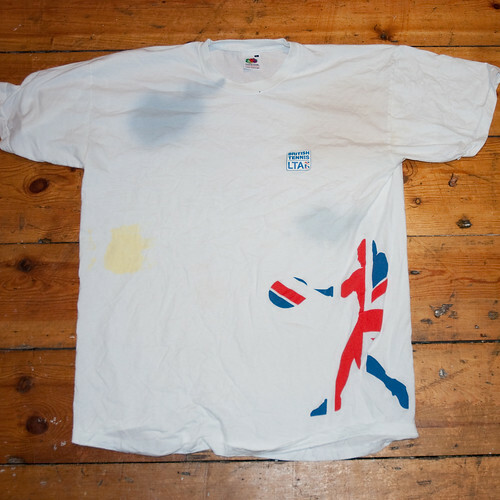 Here’s the t-shirt, ready for a wash. 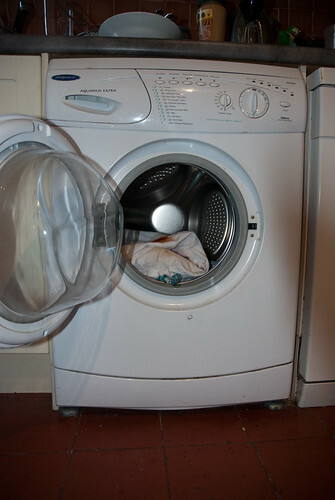 I now put it in the washing machine with a full dose of the gel (as recommended for heavy soiling). The lowest we can get the machine to is 20, 5 degrees hotter than the adverts, but I go for it anyway. and I’m sorry Ariel, but I’m not impressed. 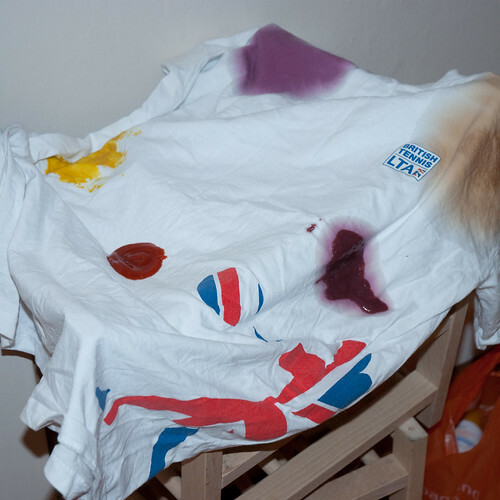 The only stain that seems to have gone is the ketchup – and that had hardly made a mark in the first place. The tea is almost gone, but still there. 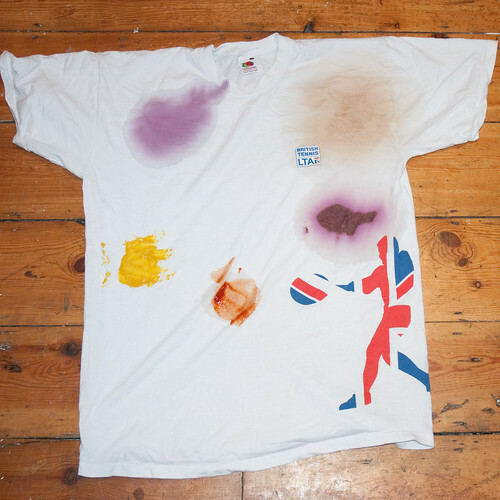 The wine and smoothie have left horrid dark stains and the mustard is still bright yellow. Now I should give a disclaimer – this was as scientific as I could get it in my kitchen – but this probably wasn’t a perfect experiment. I had no control group to compare it to, for example. But i’m not impressed. 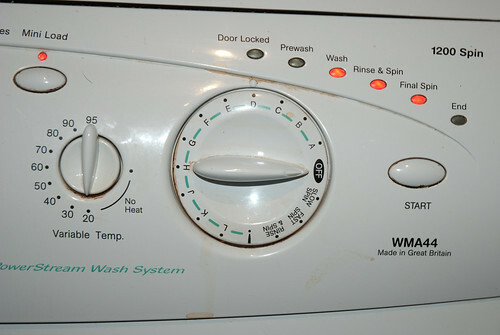 To be honest, I was never convinced that washing things at 15 degrees would ever get them clean, and this test has confirmed it for me. Perhaps I should complain to the ASA. Sometimes you have to take your hat off to a perfect piece of PR. So tonight I take my hat off to Tourism Queensland for their Island Caretaker campaign. As an idea it was absolutely perfect – advertise ‘the best job in the world’ offering someone from anywhere in the world the chance to ‘look after’ an island for 6 months and do some blogging in return for lots of money, free accommodation and, well, the best job in the world. So first they launch the campaign and get tonnes of publicity all over the world. Camera crews showing what a wonderful holiday resort this part of Australia is. Then they get a second hit, the shortlist of applicants. They make the most of the medias obsession with YouTube by getting applicants to provide video application – perfect to be shown in the applicants home countries. Finally they get to pick a winner, and I think it’s no surprise that the brit won. The UK is probably the main target market for tourism to Australia. Ben Southall being in the final at all got lots of coverage over here, but him winning it will give them more free advertising then they could have dreamed of. So well done Tourism Australia (and what every PR agency came up with the idea) and well done Ben Southall. I’d be lying if i said i wasn’t jealous.